Part art, part science, but mostly it is experience derived from thousands of hours spent on the water. Guy Waddilove talks spinnaker design. The parameters for downwind sail design have changed considerably within the last decade as sailing boats are sailing faster and at different angles. Traditionally poled-out symmetric spinnakers were used to literally push boats downwind, but as advances in both hull design and materials technology allowed boats to sail quicker, the way that sailing downwind is approached has changed. The ability of modern racing yachts to sail faster than past generations of boats means they are sailing with higher apparent wind speeds, and apparent wind angles that are shifted forward in most conditions. This development is particularly important for downwind sailing as it means that, even with deep, true downwind angles, the apparent wind is altered to a closer reaching angle so wind is flowing across the sails rather than filling them from behind and pushing. An extreme example of this would be with a performance catamaran, where virtually whatever true wind angle the cat is sailing at, the boat will still be sailing close hauled to the apparent wind as its speed through the water modifies the wind angle/speed vector. Wind flowing over both sides of a sail is a more efficient generator of power than wind pushing solely on one side of a sail so this shift in apparent wind has led to a change in the way downwind sailing is approached. The concept of flow rather than push has led to the development of asymmetrics which are flown from the bow or a prod for many modern classes of yacht, instead of more traditional symmetric spinnakers flown from a pole. When aiming to get to a point downwind in the fastest possible time, the vital piece of information that any navigator needs to know is the Velocity Made Good. VMG is a vector calculation derived from speed and course relative to the true wind. It tells you how fast you are getting to a notional point dead downwind. For example, is it better to sail a course of 120 degrees from the true wind at 10 knots or 130 degrees at 9 knots? Maximising VMG is the ultimate goal of any downwind sail design. The first things that are considered when designing a downwind sail are the target angles and wind range that the sail is to be used for; the style of boat; and any applicable rules. Downwind sails have typically taken on a coding system that is now widely used to reference what the range of the sail will be. For example asymmetric sails are coded A1 for light air VMG or downwind sailing; A2 for moderate running; and A4 for up-range running at typically 20 knots and above. Reaching asymmetrics will be A0 for light air tight angles; A3 for a more all purpose reaching sail; and A5 for an up-range reaching sail. Symmetrical sails use a similar coding; S1, S2, S3, S4. When considering the boat type, for older, heavier displacement boats it is often still advantageous to use symmetric spinnakers as this style of boat may not be able to generate the boat speed to draw the apparent wind forward and create flow over an asymmetric, particularly as wind angles get wider. The handicap or class that a boat sails under may also dictate what shape downwind sail is needed as often there will be a limitation on numbers of downwind sails onboard and the stipulation that they must be symmetrical. When the style of sail has been worked out, the designer will then refer to his database of moulds. Sail designers generally have a database of generic moulds that have been gradually developed to produce a range of standard shapes for sails. When designing a sail, the designer will adapt the parameters of the mould to suit the particular boat that they are designing for, taking into account the many factors including the boat’s size, mast material, displacement and intended use. What makes a downwind sail fast will vary on what type of boat you are designing for. Designing an asymmetric for a boat that achieves its best VMG at relatively deep angles, you would be looking to design a sail with the ability to roll to windward, giving as much area to windward of the boat as possible - similar in effect to a poled-out spinnaker with the pole squared back. The increased projection to windward would allow a boat to sail at the same speed as other boats but possibly a few degrees lower. On a TP52 or similar modern fast hull, a designer would be looking at a sail that is going to get the boat going fast earlier to enable it to take advantage of the apparent wind generated. One of the main factors that makes a boat of this type get going quickly is the position that the sail flies - the designer does not want it to project too far out to windward as the initial angles that are sailed will not be too deep. The twist profile at the back edge of an asymmetric sail will have a large influence on the way the sail performs, and ideally the design of the sail will produce maximum drive force with minimum heeling moment. This is also achieved with the design of a flatter vertical profile in the sail and a consistent angle of attack along the length of the front of the sail. One of the characteristics of downwind sails for this sort of higher performance boat is that the flying shape will change very little through the wind range because for each code of sail the apparent wind angle will not change significantly. For boats that carry only one or two downwind sails, the range of movement that the clew travels through the wind range will vary from having the clew near the back of the boat to being forward of the shrouds in stronger breezes. A higher performance sail, sailing with lower apparent wind angle figures that do not change as dramatically, will rely on the sheet moving by just a small amount to induce more or less twist as the conditions change. The luff entry angle will remain almost unchanged from top to bottom but the sail will twist at the top. For the development of larger projects, wind tunnel testing on models is used, but the high cost of lab time makes this financially unfeasible for smaller jobs. Computational Fluid Dynamics (CFD) has also become a tool that is used, but again is a costly and time consuming method suited to bigger-budget programs such as Volvo, America’s Cup and Superyacht projects. The most convenient development opportunity for any sail designer is on-water analysis of the sail he has designed. Sail designers will spend hours straining their necks, staring up at the shape of sails, watching every panel as the sheet is adjusted or the course changes. From this observation they will work out the adjustments they can make next time round to make a better-performing sail. There are also various other tools available that are becoming more cost effective and used by more and more yachts that have an active sail development program. One tool that designers and sailing teams are using on the water is the VSPARS system to observe sail shape. VSPARS uses deck-mounted cameras to track sail shape and position in real time. This information is processed by a laptop onboard and the program’s software provides accurate sail shape details based on coordinates including camber, draft, entry and exit angles and twist angles relative to the centre line. The information gives the designer the hard facts on what the sail is doing as various input changes such as sheet and halyard tension are made. The designer can take this knowledge and use it to continually improve the performance of a sail with successive iterations. The VSPAR system is also used by trimmers to replicate optimum sail shapes. The changing shape of downwind sails has driven designers to also look at the fabrics they are specifying. Traditionally nylon has been used because it is a stable, relatively robust cloth that will give a reasonable life to the sail. The development into asymmetrics, though, has increased the loads on downwind sails because of the higher angles being sailed and because the sails always have the same edge for the luff, unlike a symmetrical sail that changes from gybe to gybe. Shock loading on the sails has also increased because, rather than sailing deep downwind angles running in roughly the same direction as waves, boats flying asymmetrics are often sailing at closer angles to the waves which produces large dynamic loads with the acceleration and deceleration caused by peaks and troughs. These higher loads, especially in the front of the sails, has led to more stable materials such as polyester and lightweight laminates becoming more common in an effort to get better stability and higher strength. For sails such as the A0 and A3, similar cloth technology to that used in upwind sails is being employed and it is not uncommon to see these sails now being made in a laid fibre membrane like Stratis because of the weight and strength advantages that laminates can offer. 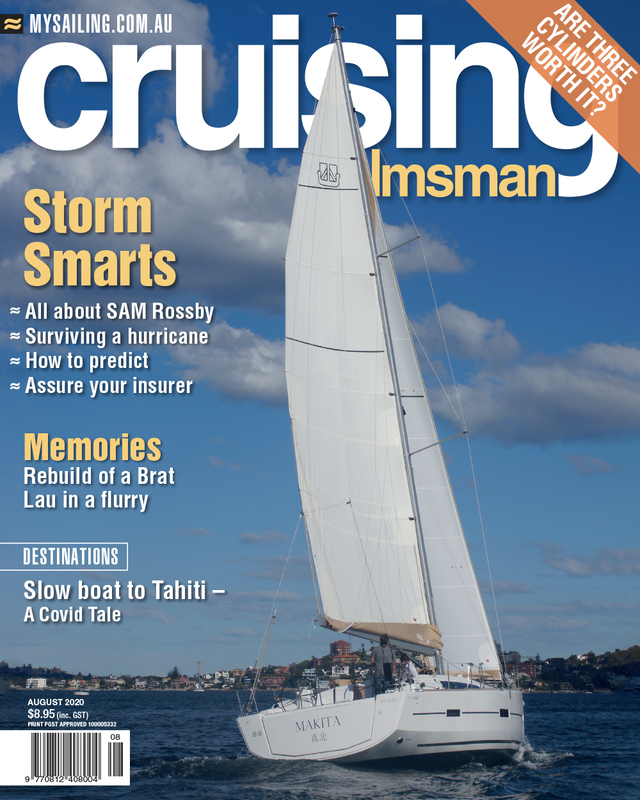 The growth in the popularity of asymmetrics isn’t just limited to racing boats; surprisingly some of the earliest adopters were the cruising boat fraternity. The ease of handling of asymmetrics compared to poled-out spinnakers led many cruisers to choose an asymmetric with either a sock or a continuous line furler for their inventory. The configuration allows short-handed cruisers to hoist or put the sail away safely and easily, simply by pulling on a line. Racing or cruising, the development of downwind sails continues to evolve with improvements in the premier racing circuits being quickly adopted in local markets. Richard Bouzaid, head of design at Doyle Sails comments, “While computer technology plays a part in the development, it is still only a tool for the sail designer to use. “My time on the water, whether its on the AC catamarans, Volvo Ocean boats, campaigning a TP52 or racing a superyacht, is where I get my most valuable information. “Running the sail development for big budget programs like these ups our design standard across the board and the knowledge is readily transferable to sailors in the local market”.